By now you've probably seen a Progressive Auto Insurance commercial on television. A bubbly young lady helps consumers choose the coverage they need from a very modern looking set of store shelves, rings them up, charges an incredibly low rate, and sends them on their way with a lot more than they expected. While Progressive does offer great coverage and competitive prices we're pretty sure you'll find it a lot easier to obtain Progressive auto insurance quotes than it looks on television. Progressive offers a wide variety of insurance options not only for standard vehicles but for alternative modes of transportation as well. They specialize in insuring private passenger vehicles, motorcycles, RV's and even boats. 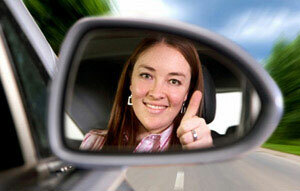 The standard Progressive auto insurance quote includes a number of different coverage options. You'll receive prices for your state required liability coverage limits as well as for comprehensive, collision, roadside assistance, rental reimbursement, and more. Progressive offers quite a number of features you may not be used to seeing from other carriers. Their customer service department is open 24 hours a day, 7 days a week – so you can always get help with your coverage, even if a nagging insurance question is keeping you awake at 3am. Progressive has claims departments spread throughout the country so someone local to you can respond personally if you have an accident and need help settling your claim. Progressive auto insurance quotes also include extra special coverage, including Total Loss Replacement and Accident Forgiveness. One coverage completely unique to Progressive is Pet Injury Coverage, ensuring that even the tiniest members of your family are covered if they are injured in an accident. There are a number of agents throughout the United States who work with and represent Progressive. Your best bet, however, is to use our website to obtain a Progressive auto insurance quote along with quotes from several other auto insurance carriers. Simply gather the information about your current auto insurance policy, make sure you're comparing apples to apples, and submit your information. We'll do all the hard work and return a list of carriers, coverage options, and quotes (including one from Progressive). The hardest part of the process will be determining which one you like best!